Evolutionary researchers have determined that settling for "Mr. Okay" is a better evolutionary strategy than waiting for "Mr. Perfect." 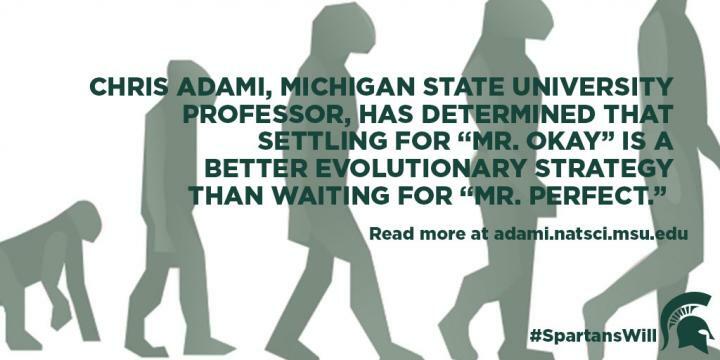 When studying the evolution of risk aversion, Michigan State University researchers found that it is in our nature -- traced back to the earliest humans -- to take the safe bet when stakes are high, such as whether or not we will mate. "Primitive humans were likely forced to bet on whether or not they could find a better mate," said Chris Adami, MSU professor of microbiology and molecular genetics and co-author of the paper. "They could either choose to mate with the first, potentially inferior, companion and risk inferior offspring, or they could wait for Mr. or Ms. Perfect to come around," he said. "If they chose to wait, they risk never mating." "An individual might hold out to find the perfect mate but run the risk of coming up empty and leaving no progeny," Adami said. "Settling early for the sure bet gives you an evolutionary advantage, if living in a small group." Adami and his team tested many variables that influence risk-taking behavior and concluded that certain conditions influence our decision-making process. The decision must be a rare, once-in-a-lifetime event and also have a high payoff for the individual's future -- such as the odds of producing offspring. How risk averse we are correlates to the size of the group in which we were raised. If reared in a small group -- fewer than 150 people -- we tend to be much more risk averse than those who were part of a larger community. However, not everyone develops the same level of aversion to risk. The study also found that evolution doesn't prefer one single, optimal way of dealing with risk, but instead allows for a range of less, and sometimes more-risky, behaviors to evolve. "We do not all evolve to be the same," Adami said. "Evolution creates a diversity in our acceptance of risk, so you see some people who are more likely to take bigger risks than others. We see the same phenomenon in our simulations."